Update, Oct 22 2011: This quick review trip was so blissy that I’ve just booked a seven night stay at the Scarlet for the week before Christmas. Which I believe is what people are talking about when they mention putting your money where your mouth is – and I can’t wait. 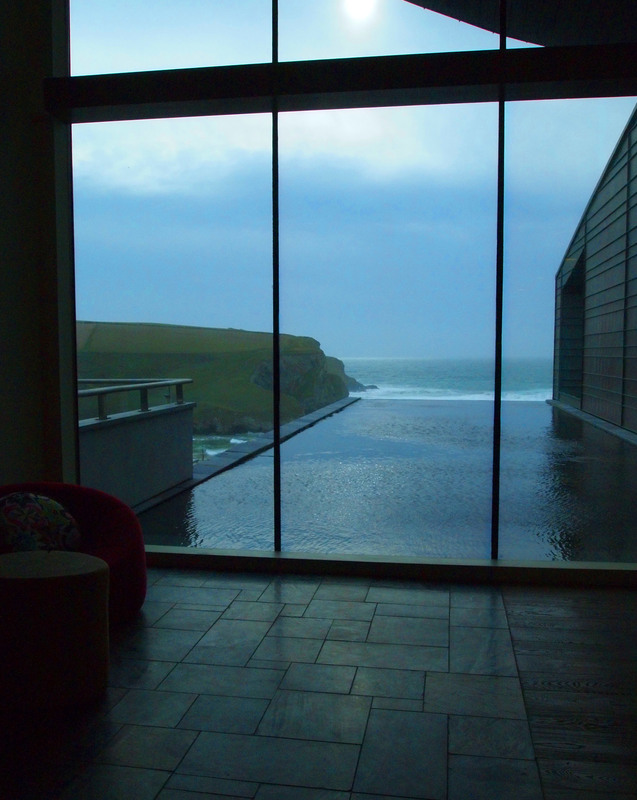 Regular readers will have seen that last week I was invited to check out (and check into) a couple of very different hotels in Mawgan Porth. 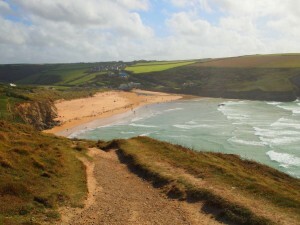 Mawgan Porth is a tiny Cornish village perched on a cliffside overlooking a horseshoe-shaped bay, where waves which have built up enough momentum on their journey across the Altantic to make a surfer’s day crash over an impossibly yellow, sandy beach. 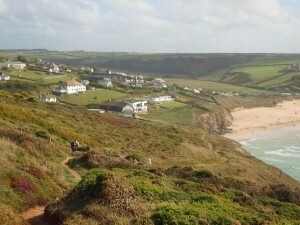 Mawgan Porth from the Cornwall Coastal Path. The Scarlet is the large curvilinear building in the middle (click to enlarge the photo) with the black roof. 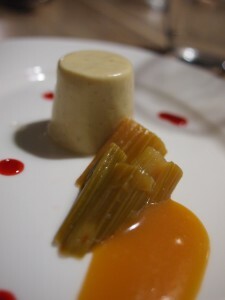 The Scarlet opened a couple of years ago with a very individual take on what a top-class hotel should offer. The first thing you’ll notice is that there’s no reception; instead, you’re shown to a comfy chair by a fireplace, with a birds’ eye view across the bay, while the receptionist comes to you and takes your details. There’s a library, a sitting room, and a large and quiet spa; the place is full of tranquil little corners to bolt yourself away in, and children are not allowed – as well as a well-stocked and lively bar, and a very classy restaurant (of which more below). There are only 37 rooms, which makes for a pleasantly calm atmosphere, and you’ll find Cornish sculpture and paintings displayed prominently all over the hotel, which has the feel of something between an art gallery and the home of a really good and hospitable friend. The view from the entrance to the hotel - a lobby with no reception desk. That's not a swimming pool, but a decorative feature which I am sure serves some ecological purpose besides being decidedly pretty. The Scarlet was built with the firm belief that it’s possible to provide a luxury hotel experience while making the minimal ecological impact, so you’ll discover that hidden away are biomass burners, solar panels, a very clever cooling system that relies on natural ventilation but offers a similar level of cooling to air conditioning, and as much recycling, reusing, and electric car charging as you can shake a (locally sourced) stick at. It’s all deeply sensible stuff of the sort that should occur to anyone who has to run their own home efficiently: unfinished bars of hotel soap are used in the laundry as stain removers, the drippy bits left behind in the bottoms of candlesticks are sent back to the candlemaker to be made into new candles, grey water is recycled, rain water is collected, and where possible, the hotel’s supplies are bought without packaging. All that you, the guest, will notice here is that your sugar cubes aren’t individually wrapped up. 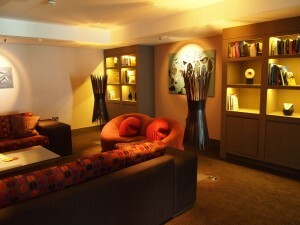 The hotel library - a perfect place to relax with a cream tea and a good book. Best of all, though, from my perspective, was the way the eco-friendliness had been carried across into the hotel spa, becoming a feature rather than an economy. Here is an outdoor pool that’s really a sort of swimming pond overlooking the sea, filtered and cleaned not with chemicals, but via a gorgeous reed bed which forms part of the pool itself. It’s a bit nippy in September, but Dr W manfully took a dip and pronounced it lovely before scampering inside for a hot shower. The pool indoors is solar-heated to a nice bathroom sort of temperature, and cleaned with very low-dose bromine instead of the more skin-unfriendly chlorine. 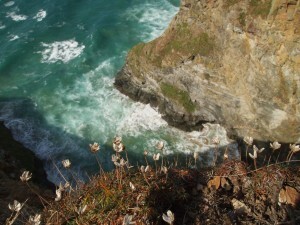 And the hot tubs are perched on the cliff-top lawn and, charmingly, heated by stoves full of logs. (Those logs can create sparks in high winds, which, thanks to hurricane Katia, precluded my having a soak.) 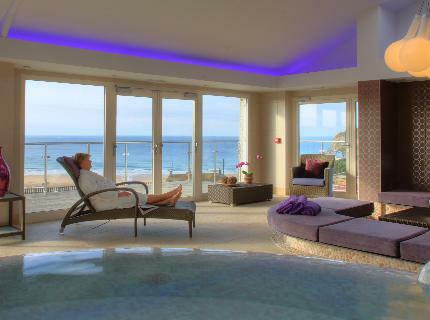 You can book a hot seaweed bath in one of these tubs, which look for all the world like giant red teacups; the seaweed is harvested locally, and apparently does all kinds of wonderful things for the skin. 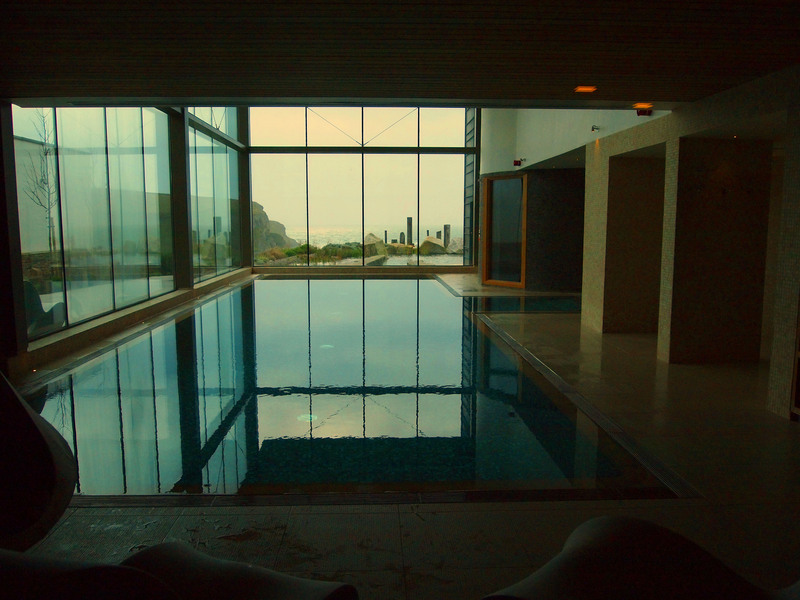 The blissfully warm indoor pool. A better option on a chilly day than the sea or the outdoor swimming pond!! Our room had big, sliding balcony doors at the foot of the bed, from which we could walk out onto a lawn on the cliff, and straight down to the sea. This was one of the best hotel rooms I’ve stayed in this year (and I’ve stayed in a lot this year; in the last month alone I’ve slept in a W in New York, a Fairmont in California and a Hilton in Arizona, none of which has rooms a patch on what’s on offer at the Scarlet). A lovely, light space coloured by the sea outside with crisp linens, blond woods, sea-toned textiles and sculptural decorations. The lighting is not something I usually do anything other than curse about in hotels – you’re probably familiar with the situation where you’re presented with six separate switches in different parts of the room, none of which do what you want them to. At the Scarlet, though, the lighting is designed to switch between seven different situations: your lighting can be architectural, ambient or mood-matching, and it’s all controlled from a central panel by the bed or one by the door. A bathroom is integrated into the room over a low wall, with a huge tub and basin on the bedroom side, and a shower and toilet hidden behind a heavily frosted glass wall. It all adds up to a sense of airy lightness, enhanced by the sun and the waves an outstretched arm away outside the window. 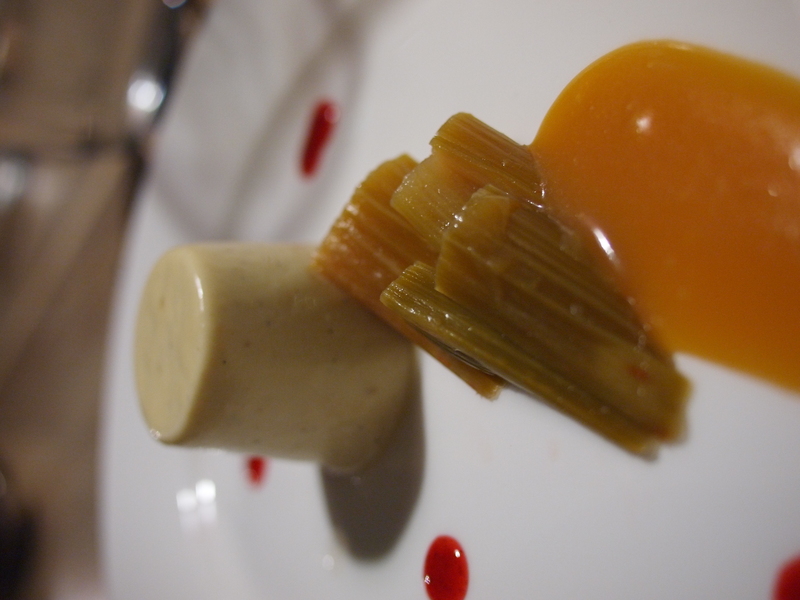 This is Gastronomy Domine, so you’ll want to hear about the food. As I mentioned in the piece I wrote about the Scarlet’s sister hotel, Mawgan Porth is very close to Padstow, a town entirely colonised by restaurants, hotels, cafes and gift shops run by Rick Stein (who himself prefers to spend his time in Australia these days). This means that an unholy number of food tourists visit the area – and the result has been to cause other, non-Stein hotels and restaurants to raise standards to a very high level. At the Scarlet you’ll be eating with that spectacular view along one wall of the restaurant, all chocolate and purple velvet and private corners. The localism that characterises the Scarlet makes itself felt in the menu, where the food is impeccably seasonal and chef Ben Tunnicliffe emphasises quality ingredients. 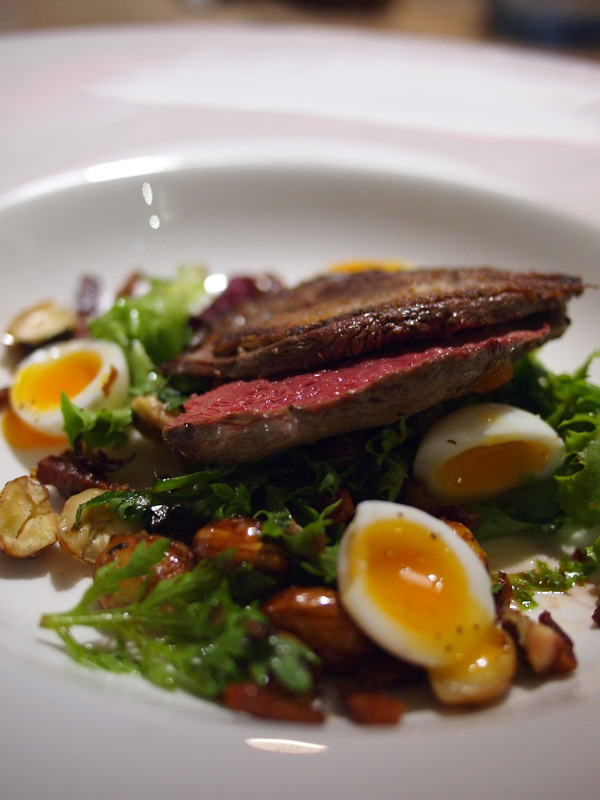 What’s more September-y than the sweet, pinkly bloody breast of a grouse served with cobnuts? The heather these little birds live in grows in abundance all over Cornwall, and after a day yomping over the moors, I can’t think of anything better to round things off than this beautifully prepared dish, so well-balanced in flavour and texture. Fish, of course, is as fresh as can be, and the monkfish tail wrapped in bacon and served with a mussel tagliatelle was based around the sort of dense and rich seafood stock that you can only dream of producing at home in a kitchen where your only fish is from the supermarket. Venison terrine, blackberry crumble (deconstructed so it arrives on the plate looking like some of the hotel sculpture) – this is a thoughtful, ultra-seasonal menu which will have changed to reflect what’s best at the moment you visit. 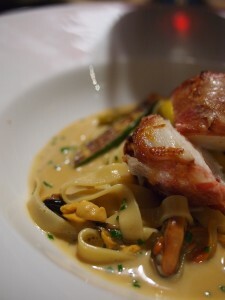 The restaurant was packed on the night we visited, and there was a bit of a delay between courses – but when that’s the worst criticism you can come up with in a 24-hour stay, somebody’s doing something very right. Grouse with a quail egg, cobnut and bacon salad - one of the best starters I've eaten this year. Simply beautiful stuff. Breakfast follows in the same vein – local bangers and hog’s pudding are on the menu (waiter service here, none of your buffet scrummage) alongside Tregida kippers, which are currently vying with Frank Hederman’s kippers from Ireland as my pick for world’s best. They’re very heavily smoked over oak, with an ethereally sweet and buttery flesh. I’ve been very pleased to discover that the Tregida Smokehouse’s produce is available by mail; I’ll be placing an order when I’m back in the UK. 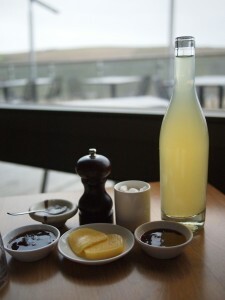 There’s apple juice on the table, pressed locally: a lovely way to wake up after a night listening to the waves break over the beach below. Breakfast table setting. Augment this lot with pastries, porridge, coffee and some world-beating kippers, and you're all set for the day. We got into the car for the drive home absolutely miserable to leave the place behind. A 24-hour stay simply wasn’t long enough. I’ll be back at the Scarlet as soon as I can as a paying guest, and I hope you decide to take someone you love very much too, for a weekend or so of calm, indulgent grown-up time. 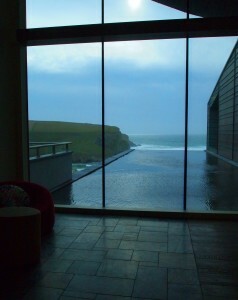 I was invited to spend a weekend at the Bedruthan Steps hotel and its sister, The Scarlet, in Mawgan Porth in Cornwall. These are two hotels catering for very different audiences, but sharing an ecological, food-loving ethos – and one of the greatest sea views you’ll ever wake up to. I don’t have kids. It means that I’m blissfully ignorant of things like baby monitors, the school gate experience, feeding times and other arcane kid stuff. So I was a wee bit worried about being invited to the Bedruthan Steps, which is heavily advertised as being family-friendly. I’d resolved to steel my way through a day of kids, then collect my reward at the Scarlet in the company of grownups the next day. A total surprise, then to pitch up at the Bedruthan Steps, admittedly full of pre-vocal people accompanied by their carriers/feeders/cleaners, and find it weirdly tranquil. The management know that not everybody wants to spend their day being poked with a plastic shovel, so to that end, there are plenty of adult-only areas (and a teenager-only area which Dr W had a good old whinge about not being allowed into so he could play pool). This works well for parents, too, who don’t have to worry about their kids’ noise and play annoying the kid-free; the kid-free are all in the adults’ lounge, the bar, or the adult-only pool. Breakfast saw us and all the other childless visitors put in a child-free section of the restaurant. 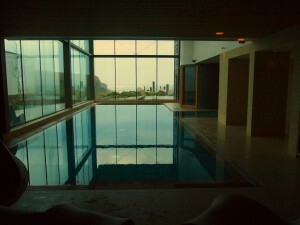 There’s also a no-children swimming pool and spa. And this place is beautiful. Externally – well, not so much; you’re looking at a white 1950s monolith stacked up the cliffside in steps. But inside, the Bedruthan Steps is a lovely thing: all marine colours, pale woods, sculptural shapes, Cornish artworks and handsome textiles. 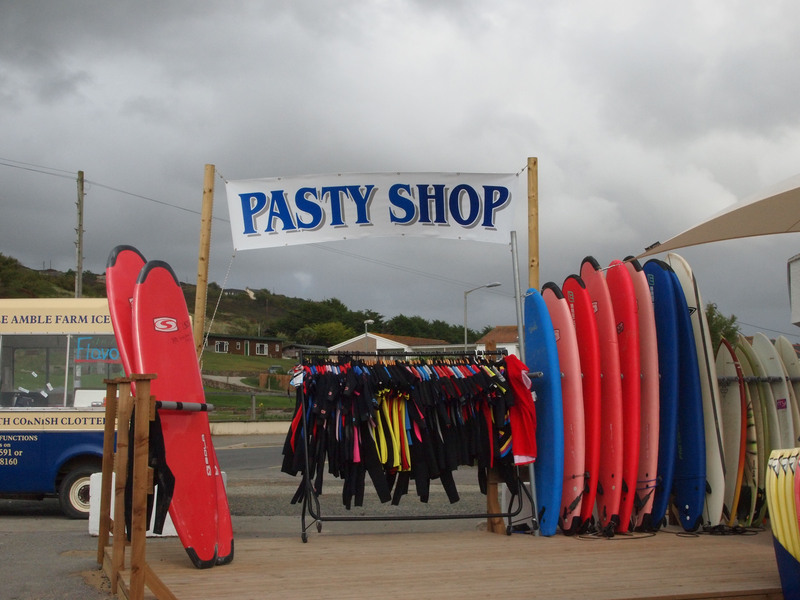 Cornish cliches in Mawgan Porth village: clotted cream ice cream, pasties and surfing. All that's missing is a scone and some tea. If you do have kids, then you are really the person this hotel is catering for. Baby monitors in the rooms; a children’s club; an adventure playground with scrambling nets and a kids-only zip wire (cue more howls of disappointment from Dr W, an 8-year-old in a six-foot microchip architect’s body). The spa offers those special pregnant-lady massages, alongside all the usual treatments. All the baby stuff that my baby-owning friends have to tote around with them is provided, so you’re not going to have to pack the car to the gills – you can use the hotel’s plastic baby cutlery, cots, bibs, reusable nappies and potties (four words which I hope never appear again on this blog) for free, and if you want, you can also rent strollers, sterilisers, bouncing chairs and bottles for a very small fee. Our room had a double bed separated from the rest of the room by a half-wall, and two single beds for our imaginary children to sleep in in the living area. Hotel room - and that view! There’s a lot of attention to detail in the child facilities, and I did feel that that same attention to detail was missing in small ways in the rooms (perhaps it was just the bad luck that comes with being assigned room 13) – I could have done with a towel rail and loo roll holder that stayed attached to the wall, and I could really have done without the half-used bottle of lubricant that a previous guest had left in the bedside drawer. But the view from every bedroom, of Mawgan Porth’s gorgeous little sandy cove and the impossibly blue Atlantic pounding up to the beach – that’s worth all the nasty bedside drawer surprises in the world. We opened the window in the night to breathe in the sea air, and to listen to the wind and the waves; better than any prescription sleeping tablet. There’s lousy cell phone reception up here on the cliff, which makes for a fantastic excuse not to pick up the phone to talk to work while you’re away. 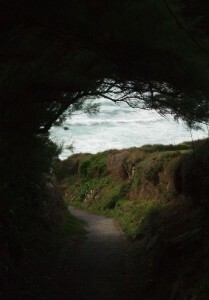 You can walk down to that beach in about five minutes. It has a dedicated lifeguard and makes for a perfect sandcastle-making spot. 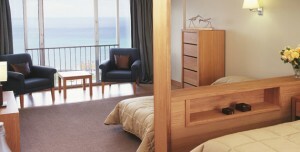 It’s also good for surfing, and you can arrange lessons with Nick via the hotel’s front desk. The hotel is only a few yards from the Cornish Coastal Path, and there’s some great walking in both directions along the cliffs. Padstow, now entirely colonised by Rick Stein restaurants, gift shops and hotels, is just up the road. This has been great news for diners visiting this part of Cornwall – rather than allow him to have the lock on good eating in the area, the other hotels and restaurants around here have really raised their games. Dining at the Bedruthan Steps, overlooking the bay through the restaurant’s ceiling-height windows, you’ll find a menu that changes daily; mixing simple, traditional cooking with more exotic (but never unapproachable) flavours like sumac and green curry. 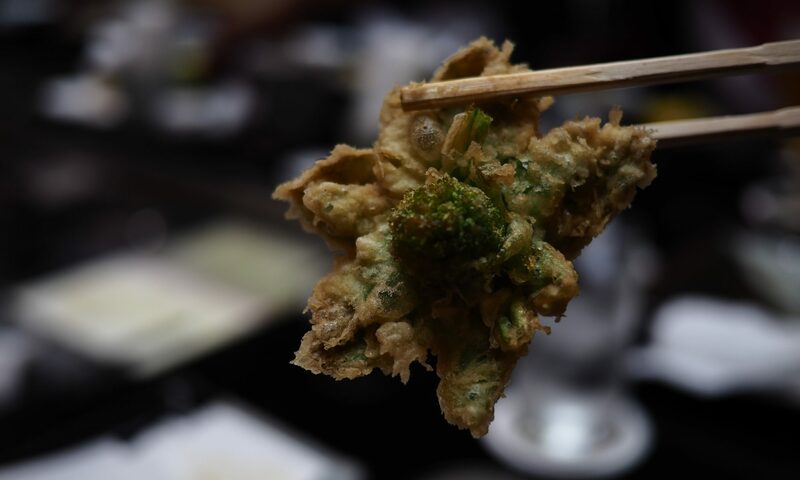 The fish here is local, admirably fresh and carefully selected, but if you’re not a fish person, there’s lots of choice, from vegetarian dishes to some great locally, organically raised meats. 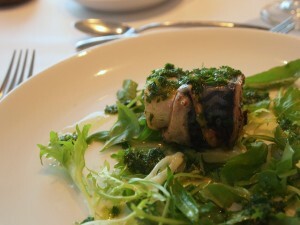 Locally fished mackerel stuffed with cracked wheat, currants and pistachios had sweet flesh, rich with oil, underlined by a sharp, herby gremolata dressing. 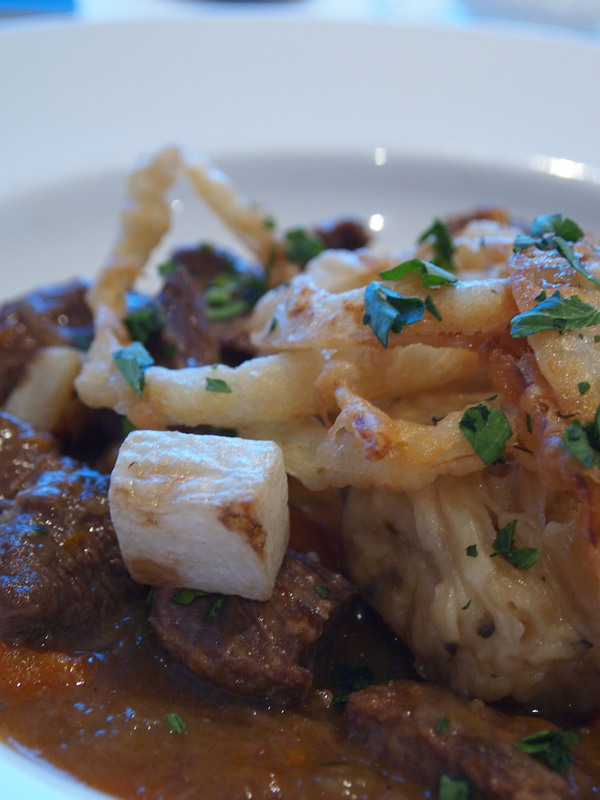 And a beef casserole, full of local vegetables, had a lovely dumpling floating in the middle, light and airy: this is family food just like my Mum used to make. 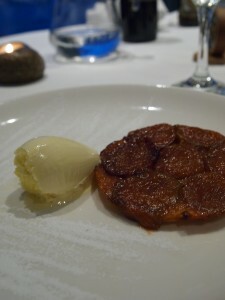 Cornish plums and Mawgan Porth lavender in a tarte tatin – locavores can quite literally eat their hearts out. Cornish beers (I was there for a Harvest Festival celebrating local beers and produce) stand alongside some extremely good Cornish fruit juices – of course, if you’re a wine drinker, there’s also an extensive, non-Cornish wine list. Alongside this localism, you’ll see a real commitment to sustainable, ecological management of the hotel. The food and drink aren’t the only locally sourced things you’ll see here – soaps, stationery, and even the hotel’s building materials are all from the local area. 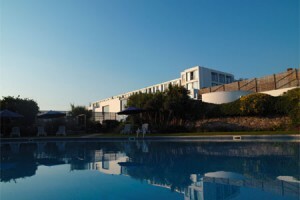 There’s solar heating for the outdoor pool; the rooftops are planted with grass; and the hotel has a year-round commitment to keeping the beach clean. There is constant waste and energy monitoring, motion-sensitive lighting in some areas, and a slightly irritating towel rental policy if you want more than the one per person that you’ll find in the room for the pool or beach. If you’re a parent of children of any age, I can’t think of anywhere you’ll find a better mix of things for the kids to do and for you grown-ups to enjoy too. There’s so much to do in the surrounding area, but if you want to stay in the hotel, there are weekend activities for adults: shoe-making, bread-baking, beekeeping, toddler-management, yoga and so on. (Check the hotel website for what’s on when.) Summer in Cornwall is late in finishing; when we were there in early September lots of families with pre-school-age children were taking advantage of the final flush of the south-west sun. Older children appear in the school holidays. Just watch out for the contents of the bedside drawers in room 13.